Slavonic Dances (Op. 46) is presented as a Solo for Flute, Clarinet or Alto Saxophone with a play-a-long Audio CD which also contains SmartMusic SMP Files. 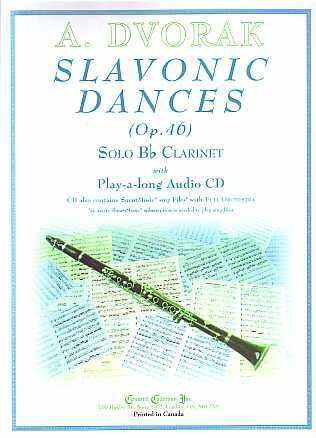 This edition of Slavonic Dances (Op. 46) is ideal for anyone who is studying or listening, to better understand and, in general, enjoy the wonderful music of these outstanding pieces! Antonin Dvorak, violist and composer, was born on September 8, 1841 in Nelahozeves, Czechoslovakia and died on May 1, 1904 in Prague. He is one of the most important Bohemian composer of the Romantic Period in Music (1825-1900). As principle Violist with the Provisional Theatre Orchestra of Bohemia from 1862 to 1871 Dvorak played under many conductors including Bedrich Smetana (1824-1884), principle conductor from 1866 and Richard Wagner (1813-1883) in February, 1863. In 1877, Johannes Brahms (1833-1897) suggested that his publisher Fritz Simrock (1837-1901) publish Dvorak’s music. Simrock commissioned Slavonic Dances (Op. 46), completed in 1878, originally for Piano “Four Hands” (i.e., two players), then orchestrated for full orchestra. In 1886, at Simrock’s continued urging, Dvorak composed a second set of 8 dances: Slavonic Dances (Op. 72). Dvorak composed a very wide variety of music for almost every medium including 9 Symphonies - the most famous being the New World Symphony (Symphony No. 9 in E Minor “From The New World”), numerous Concertos (Piano, Violin, Cello), more than a dozen Operas, and a vast amount of Chamber and Choral music. No. 1 in C Major (Furiant) A characteristic Czech dance, its character is fiery and impulsive, but in a cheerful, exuberant frame. Dvorak also used this form with No. 8 as well as the the Scherzo movements of his String Sextet, Op. 48 and his Symphony No. 6 in D major, Op. 60. No. 2 in E Minor (Dumka) The Dumka is a Ukrainian plaintive slow dance with a more animated middle section. Dvorak actually combines elements of the Dumka with those of the Polish Gumenjak and, in the quick section in major, the Moravian Ovčácká (Shepherd’s Dance). No. 3 in Ab Major (Polka) in the original Piano Four Hand version this was No. 6; Dvorak reversed these two dances in the orchestral version; it also contains sections related to the Kucmoch (or Klatovák, a dance from Klatový), to the South Bohemian Hulan (“lancer,” a form made familiar by Smetana) and, at the end, the Skočná (a “spring dance”, one involving leaping or hopping). No. 4 in F Major (Sousedská) a Waltz like form related to the rural Austrian Ländler. The Moravians designate it Minuet-Mazur. Dvorak’s marking is simply Tempo di minuetto. No. 5 in A Major (Skočná) a “spring dance”, one involving leaping or hopping. No. 6 in D Major (Sousedská) could also be designated a Mazurka. No. 7 in C Minor (Skočná) another dance involving leaping or hopping. No. 8 in G Minor (Furiant) more fiery and brilliant than the opening number. In this arrangement No. 4, 7 & 8 are in the original keys but to make for “more friendly” key signatures, No. 1, 2, 5 & 6 have been transposed up a semi tone and No. 3 up a whole tone.